2.6 has turned out to be an important patch for Commandos, bringing the biggest changes to the Combat Medic talent tree since 1.2. Seriously, 2.0 had nothing on this. Basically, the developers actually made good on some of the things they talked about in the class Q&A back in October. Shocking, I know. For one thing, Hammer Shot can now be cast on yourself, something that I'm sure every healing Commando has longed for since they first got Combat Support Cell. For all that, I'm actually finding it strangely hard to adjust to this change. I guess more than two years of training myself that a skill works one way but not another will take some time to overcome. It doesn't help that habitually, I do a lot of self-healing by hitting my heals without having a friendly target (which makes them default to me) but this doesn't work with Hammer Shot. If I have no target it just gives me an error message, and if I have an enemy targeted I obviously end up shooting them instead. When this change was first announced, a lot of jokes were made about Mercenaries and Commandos shooting themselves in the face, but I had faith that Bioware would give us a sensible alternate animation. (Just like Scoundrels and Operatives also don't shoot themselves with their Emergency Medpacs, even though the ability is a shot when targeted at other people.) The final result is... okay I guess, if a bit boring. I haven't seen the Mercenary version yet, but we Commandos just tap a button on our gauntlet. I was hoping that we'd still interact with our weapon in some way at least. The animation is currently also lacking a sound effect to go with it, which makes it feel oddly floaty as I get no audible feedback when triggering it. The bigger change however is what they did to Trauma Probe. It's funny, but when they first talked about allowing it to be cast on multiple targets, I thought that maybe they meant two targets: so I could use it on myself and one other in PvP, or put it on both tanks in an 8-person operation. No, what Bioware did is nerf the ability in pretty much every respect (duration, charges, healing output per charge) but we are now allowed to put it on as many targets as we want. Yipes! This is a massive change to our raid healing ability. To put things into context, the old Trauma Probe would maybe make up ten percent of my healing on an operations fight, on a good day, assuming that I managed to keep it refreshed on the tank and they took a steady amount of (ideally) small and fast hits. (The tank on Tu'chuk in the Cartel Warlords fight in Scum was a perfect target for example.) I combat-logged our first operation after the patch on Friday (Dread Fortress and Palace hardmode), and on pretty much every fight, Trauma Probe made up twenty to forty percent of my healing. What a change! It definitely takes some getting used to though. My regular healing partner in ops is a Sage, and we always had a sort of unspoken agreement that I would focus on the tanks and would let him focus on the group, since that's what our respective classes are good at. Now I'm a bit torn as to how much use to make of Trauma Probe, because while it's great to have it cast on everyone, every time I refresh it on a dps that's also one global cooldown I'm not using to cast a big heal on the tanks. From what I've seen so far, it seems sensible to pre-cast it on everyone before the fight (yay, more busywork in addition to building Combat Support Cell stacks), keep it refreshed on the tanks, and refresh it on the dps whenever there's a bit of a "quiet period" during the fight where not much damage is being taken, so that it can provide a buffer on everyone once the next big AoE hits. 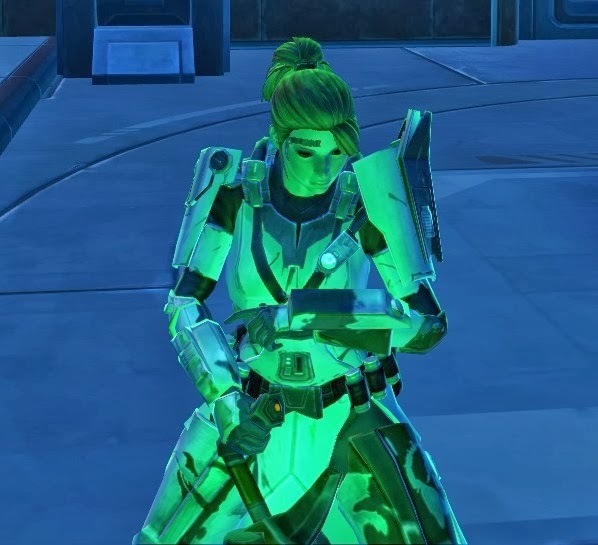 I think there is a bit of a temptation to just spam it on everyone all the time the way some Scoundrels/Operatives do with their heal over time, but for a Commando that's really not a good idea, seeing how Trauma Probe doesn't actually fill anyone's health pool back up; it just softens the blow of damage being taken by reducing it a little. You still need to cast "proper" heals to keep people up in the long run. In PvP, where everyone pretty much takes damage all the time, the new Trauma Probe is predictably amazing. Suddenly my class is back en vogue, and I regularly see two or three Combat Medics per warzone, some of them getting amazing healing numbers of over a million, something that I've only very rarely achieved on my own Commando (and have rarely seen other Commandos achieve, pre-patch). Unfortunately all those other Combat Medics suddenly invading my warzones are also pretty annoying, as Trauma Probe doesn't stack, so it's a constant war of Commandos trying to overwrite each other's probes before the match, so they'll get credit for the 10k healing or so each probe will do if all its charges get used up. Worse, according to the forums there is currently a bug so that casting over an existing Trauma Probe will count as refreshing it for the original caster instead of giving the refresher credit. So in a warzone with three Combat Medics, if one of them pre-casts probes on the whole team before the match and then everyone keeps them refreshed throughout (admittedly unlikely as people die etc. ), you could in theory have the work of three people leading to only one person getting credit for everything. Yeah yeah, "who cares as long as you win"? Of course winning is more important, but surely healers are allowed to be competitive too and to see their play parsed correctly? THANK you for posting about this. I've been so curious about these changes. Forum responses are mixed, as usual, with the complainers still complaining. How does ammo management work out with multiple trauma probes out there? Also, how do you track them, so you don't over-refresh? I find it hell to track how many hots I have out there when I'm playing my operative, but with my sorc, I can track my bubbles by their debuffs (roughly speaking). How does ammo management work out with multiple trauma probes out there? They also reduced the cost, so at maximum regen it's ammo neutral and you can spam it until the cows come home. If you start at a lower regen level, spamming probes will drain you, but slowly. Also, how do you track them, so you don't over-refresh? Heh, with difficulty. On the tanks it's not an issue as I have them targeted most of the time anyway but on everyone else it's currently a bit tricky as I have buff size shrunk down to a minimum. (It used to be unimportant, ok?) I just do a lot of target-switching right now, and if I have enough ammo and nobody's about to die I'd rather refresh early as it basically costs me nothing but the global cooldown (as per the above). I also have buff size minimized in raid frames. It only shows 4 buffs and they're never the buffs you need to see (hence it's easier tracking a bubble because of the debuff). I do keep making my buff icons bigger on my target, and that's about all the checking I can do during a fp or op - when I happen to target someone who needs healing. Still it's hard to see my little buff in a SEA of the tank buffs that they get in a flashpoint. Like ROWS of buffs. It's sad that my enjoyment of a class is inversely proportional to the number of dots/hots or procs in that class. A class that I would probably like if I had the right tools is a frustrating exercise in squinting in our pathetic ui. I don't miss wow, but I do miss the plugins. Especially grid.